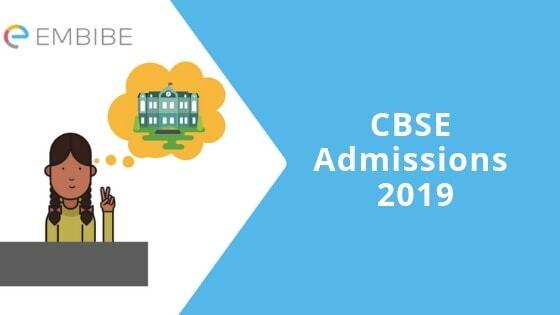 CBSE Admissions 2019 | Central Board of Secondary Education (CBSE) is one of the largest educational board in India. CBSE Has more than 17,000 schools in India affiliated with it. The important fact about this board is that it follows the same academic structure into all over India. As per the academic rules, CBSE will not allow students for the admissions if they do not fulfill the minimum requirement. We are including some official CBSE Admissions rules for your reference. As per the rules framed by CBSE, to secure admissions into class 1, the minimum age requirement is 5 years and the maximum age is 7 years. The students should calculate their age until March of the year they are applying in. Just like other boards, some general rules for CBSE Admissions include having an equivalent qualification and required documents like TC/ LC etc. It is also mandatory for the students to score the required marks in the class to be promoted. A– In order of being eligible, it is mandatory for the students to pass their qualifying course from any state board or any board recognized or approved by the Government. B– No admission will be accepted if the student has qualified his or her course from any board which is not approved by the State or Central government. C– The Age of the applicant students should be compatible as per the class they are applying for. D– The qualifying examination should be cleared with the minimum required marks. E– Any student migrating from a foreign country will not be eligible for the admission unless his or her school was not affiliated with CBSE. Moreover, CBSE will release an eligibility certificate for the students if required. F– Any student with the status of debarred, rusticated or expelled from the course or the examination shall be allowed for the admissions. G– Without fulfilling the regular course, no student shall be admitted or promoted into the next class of the schools affiliated with the board. The CBSE Admissions requirement will keep changing as per the level of the education. Here, we are providing you specific admission guidelines. These guidelines can be helpful for you in making you familiar with the requirement for the admissions. CBSE Admissions Till Class VIII- The admissions will be conducted as per the rules and regulations framed by the state or Union territory governments of the location of the institution. CBSE Admissions In Class IX- For Class IX, the student must have finished his or her regular study of Class VIII. The admission process will be conducted only for the students who were studying in any institution-affiliated by state governments or UT governments or other certified board. CBSE Admissions in Class X- To be eligible for the admissions into Class X, it is mandatory for the students to have finished their class IX from a recognized board. The admission also requires the qualifying marks into the equivalent examination. Moreover, transferred students should have TC and other documents to apply for the admissions. CBSE Admissions in Class XI- Students who qualified their class X from recognized state board or the university are eligible for the examination. This section provides the opportunity of choosing the favorite stream. However, it is mandatory to score the minimum score to be eligible for the favorite stream. CBSE Admissions in Class XII- There will be no direct admissions to Class XII. Students must have qualified their class XI from the same institute. The admissions can be provided under the special regulations to the students shifted from other schools or cities. Also, the student must have passed their equivalent qualification from a recognized board. Hence you know that every official procedure requires some verification documents. Moreover, the list of required documents for CBSE Admissions is given here for your reference. However, you know that CBSE is one of the most prominent boards of the country. So, choosing this board can be beneficial for the career of the student. The CBSE board is known as the most student-friendly syllabus in India. Moreover, the syllabus is also known as interesting and fruitful. Additionally, NCERT has approved the CBSE syllabus. So NCERT books are also suitable for the preparation of the same. We hope that our article on CBSE admissions was useful for you. If you have any query or feedback to share with us, please feel free to drop a comment below. We will get back to you within a very short period of time. In the end, Wish you all the very best for your exams and other future challenges on behalf of Embibe.